We have just added 2 more wiring harnesses to help make light installation even easier. With the additional wiring options we now have, you can wire smaller vehicles with a pair of LED or HID post mount Brite Lites on a motorcycle or ATV much easier with our motorcycle harness (BL-WHMC) and, if you have a large UTV or truck and need 2 big lights, like light bars controlled separately, our new super large double light harness (BL-WHHD2) will allow you to wire a light on the front of the vehicle and one on the roof or back, all using one wiring harness. We also have our basic standard wiring (BL-WHSTD) for someone that wants to totally customize the wiring, and our best selling heavy duty wiring harness (BL-WHHD). All wiring harnesses cone with simple switches and ring terminals for connecting to the battery or power source. All our heavy duty harnesses come with the same light bar waterproof connector to mate up to any of our Xtreme Off-Road LED Light Bars. This is our best seller and most complete wiring option. Great on UTV, TRUCK, ATV applications for connecting one light, or light bar. 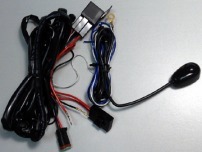 Heavy Duty wiring harness with 2 light outputs, great for vehicles where 2 lights/ light bars are located in separated areas, like one on the front bumper and one on the roof. Switch operates each light separately. This harness was designed for smaller vehicle use, like installing a pair of post mount LEDs or HIDs on a motorcycle or ATV, when both lights are to be connected together and operated from the same switch. Designed for use on 2 lights up to 150 watts total power consumption. Our standard wiring harness is designed for someone that wants to totally customize the wiring project and cut wires, route separately and have full control of the wiring process. Simplified and no external jacket over the wires to make customization easy.